Participants will learn the step by step process of preparing natural fibres to pulling sheets of handmade papers. 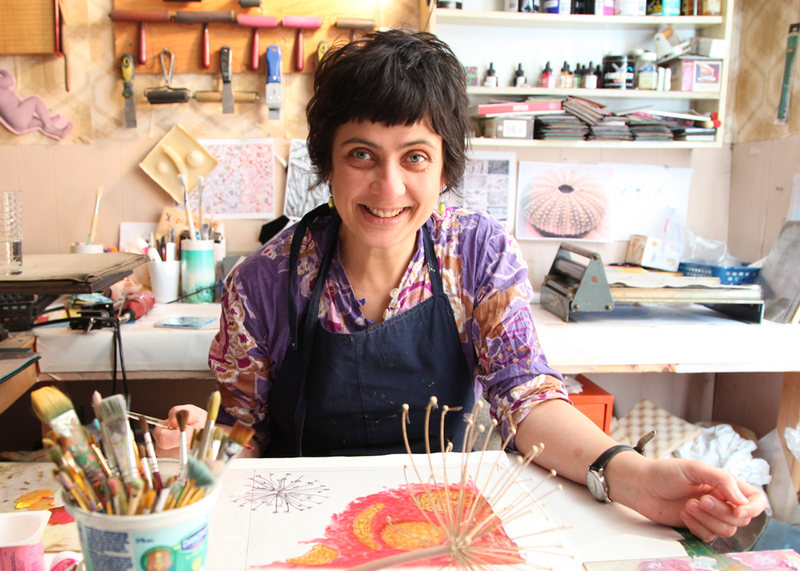 Join Anita Singh for her artistic approach to papermaking and experiment with how natural fibres such as buttercups, lupins, roseroot, ferns, knapweed, johnsongrass, dandelions, seaside bulrush, lake grass, wild orchids, onion skins and recycled papers can be transformed into works of art. Participants will learn fibre preparation, make various pulp baths and pull sheets of unique papers. Participants are urged to bring inclusions of wall paper, pressed plants and flowers, feathers, string, lace, fabrics, and any flat thin objects that won’t be damaged by water, as well as any fibrous plants they would like to try. This class is open to all levels of experience, including beginners. I first became interested in papermaking in 1994, exploring fibres and forming sheets, first on my own with unsatisfying results, then took my first class at a community center in Victoria, BC. I became obsessed, everywhere I looked I saw possible fibres to explore. During the fall of 1996, I began my internship at the Womans Studio Workshop in upstate New York. This studio is well known for papermaking, bookarts and printmaking, they offer alternative space for artists to create new work and share skills through residencies, apprenticeships, fellowships, internships, workshops, classes attracting artists from around the world. I was fortunate to experience one whole year in this environment creating and learning varied approaches by professional fibre artists from around the globe. I experienced growing and harvesting different fibres, varying methods in preparation and techniques in forming sheets, creating low relief and three-dimensional artwork. I have continued to work with fibres creating artist books, paper quilts, print works using my handmade papers and sculpture. In 1999, I self published a small edition of 30 artbooks, titled “The Paper Recipe Book”. This book contains my handmade papers, each sheet illustrates information of how that paper was created. This book is now in special collection libraries around the world. I have been teaching papermaking in Newfoundland the past 13 years, to all age groups, through the Anna Templeton Center, an Artex Conference, Harbourside Studio, Visiting Artist, and ArtsSmarts programs as well as other organizations.